A downtrodden Governor Chris Christie apologized to the people of New Jersey today in his first press conference since the revelation of emails proving his staff’s involvement in creating traffic problems on the nation’s most trafficked bridge as political retribution. 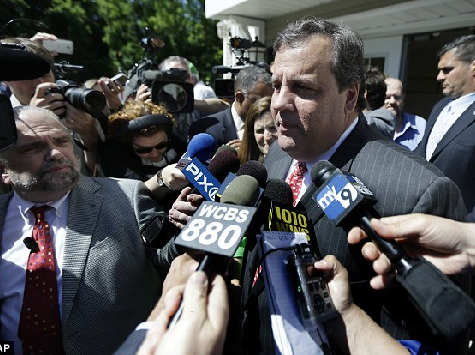 The emails’ authors have been fired, and Christie will visit Fort Lee, NJ today. “Ultimately, I am responsible for what happens under my watch,” Christie told his audience, adding that he was “embarrassed and humiliated by the conduct of some of the people on my team.” He repeated multiple times he was “stunned by the abject stupidity” of the emails and behavior and apologized multiple times for the entire incident. Christie divided his press conference into two major announcements: the termination of Deputy Chief of Staff Bridget Kelly’s employment and a series of further interviews with staffers to see whether he has to fire anyone else; and the removal of Bill Stepian from the top of both the State Republican Party and a position of leadership in the Republican Governors’ Association. “I can never allow personal feelings or longstanding relationships to get in the way of my doing my job,” he emphasized as he announced both of the firings. Christie noted that he told Kelly and every other staffer that they had one hour to tell him or his chief of staff whether they had anything to do with the traffic jam in Fort Lee, and all said they did not. He then told the press that no one in his staff had anything to do with the incident. “This was obviously a lie,” Christie noted, adding that “there is no justification… for ever lying to a governor or person in authority in this government.” He fired Kelly because “she lied to me,” as well as Stepian. After his announcements, Christie took questions from the press, answering that the tone of his administration did not encourage the behavior. He stated he would not change his personal speaking manner over the incident, because he was not a “focus-tested, dry” politician.